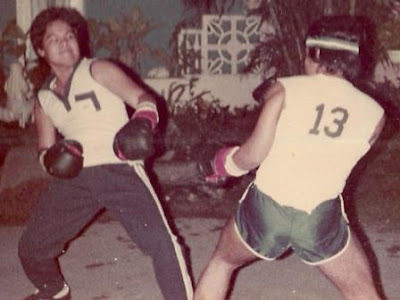 One of the sports hobbies I dabbled in during my younger days was boxing. No, it wasn't anything serious or competitive. In fact it was just my brother who I sparred with and this was at our front yard. We had a front yard with concrete paving and was large enough for half-court basketball playing. This was in the early 80's, I believe. I was just finishing college and my older brother was already working. I don't know how exactly it came about, but my brother one day asked if I'd be willing to do some "play" boxing. The concept of just swinging your arms around and playing sounded so easy and simple enough that I just snorted "sure". Well, the next thing I knew, my brother brought home 2 pairs of boxing gloves. I already forgot what size or weight those boxing gloves had, but my first thought when I saw the boxing gloves was that they were huge! In fact, I thought they were over-sized and were for bigger guys. Not content with just the boxing gloves, my brother also bought a pair of boxing head gear that were heavily padded. I don't recall paying him a cent for all this boxing gear equipment. You could say that he was really into it. My brother is 5 years older than me and definitely much bigger. He got into bodybuilding once in his college days and I saw him bulk up with muscles. His workout was mainly with a bodybuilding equipment called the Bullworker. Supposedly, it uses the concept of isometric training for building strength. Although several models of Bullworker came out, I believe the one he bought resembles the one below. Those 2-piece cables are actually strands of steel wires covered with a heavy-duty plastic rubber material. Here's another way of exercising with it. The Bullworker came with a chart for performing various exercises. It was truly a rage in those days and I really believe it helped him increase his physical strength. I didn't think much of the sparring we did together, even with his size. I thought that I had stamina, and was much quicker and lighter on my feet. I suppose what that means is that if I can't outlast him in our sparring sessions, I could at least outrun him. That's me with the headband connecting with a left cross. My bro and I spent weekend afternoons (until dusk) sparring in our front yard. Sorry for the headband. That's part of the 80's "let's-get-physical" look, I suppose. My aerobic conditioning at that time was also supplemented with the amount of running that I did. Again, it was nothing competitive but I thought I was actually good enough if wanted to be serious. It's one sport that I sustained for quite a while. Jumping rope, boxer style, is something I developed on my own. With boxing as a weekend hobby, I thought of buying a jump rope and quickly developed a nice steady rhythm with the jump rope. My brother never got the hang of it though. You see, if you're a big guy and have rhythm, timing or coordination problems, jumping rope can become very tiring. Scrawny kid with the scrawny delts. That's me with a well-worn sleeveless old high school shirt with the number 13 at the back. I no longer remember whatever happened to our boxing gloves then. I do know we didn't use the padded boxing head gear because for me, it was too heavy and just got in the way. The extra padding around the cheek area also limited my visibility that I quickly chucked it. 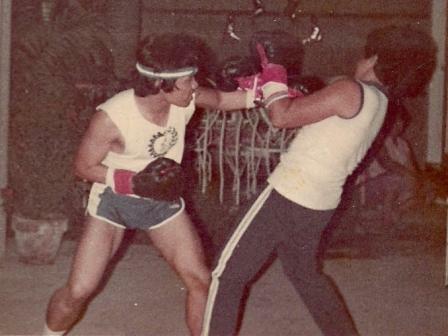 Many years later, I revived my cardio fitness training with boxing, but no sparring. I bought a heavy bag and a pair of bag gloves. These aren't the sparring gloves but punching bags for heavy bag work. But those too, had to go. The heavy bag got ripped and I gave away the bag gloves. Compared to sparring, going it alone on the heavy bag can become monotonous.